It should also be noted that the historic events which are described here regarding the significant revolt of the Ecuadorean proletariat of the 1920s are part of a universal history, part of a high point of proletarian revolt in the years after the First World War. The dissemination of this historic memory constitutes an important aspect of the consciousness the proletariat needs to grasp to escape from its current situation of weakness and vulnerability to a capitalism constrained to encroach upon its conditions, to demolish its past gains whilst at the same time containing any class response through the unions and reformist labour movement – the enemy within our class. After years of struggle, organisation, propaganda and agitation, on November 15, 1922 in Guayaquil, Ecuador, the proletariat of the time (rail, cocoa workers, bakers, shipyards, printers, masons, cooks, laundresses, etc.) declares a general strike and took control of the city (there was even talk of "the Soviets or Workers' Council of Guayaquil"). But the bourgeoisie (agricultural exporters, bankers, industrialists) was terrified that this "mob" would go further and the same day sent its police and military pack to brutally repress it. 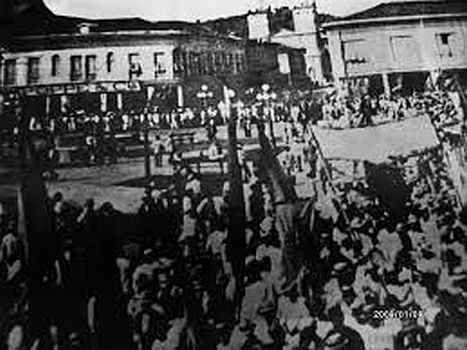 The day of action was transformed into slaughter (over 1,000 dead), the terror of the bourgeois state stained the streets and waters of the main port with proletarian blood, while "white and delicate hands applauded from the balconies" the return of bourgeois “order”… Such was the "baptism of blood of the proletariat" in this country. But rather than the strength of our class enemy, this fatal defeat was down to the weaknesses of our working class of that time: lack of autonomy and combativity against the government and, above all, lack of radicalism or a break with the Social democratic programme (including both its "socialist" and "anarchist" versions), while at the same time lacking a rupture with the unions, with patriotism and religion, and finally lack of a revolutionary leadership and offensive weapons. Today in this country, along with the bourgeoisie, two enemies are: the government and the unions. This government, even claiming to be "revolutionary", "socialist" and even "a workers’ government" actually is, as all government, the keeper and administrator of capitalist exploitation and normality, the democratic and civic dictatorship of Capital over our class, the proletariat. In fact, this November 15, 2014 it made a rally/show to publicly announce its "reform package" of the labour code, i.e. the adjustment of this classic instrument of control and capitalist exploitation of the working class to shape control, exploit and subjugate us further. No doubt that this progressive government is bourgeois, the enemy of the proletariat. As if that were not enough, it usurps this historic day for our class, cynically attempting to distort and to empty its proletarian and anti-capitalist content; to usher away the very memory of the proletarian social revolution, the ghost that has continued to haunt the entire world: communism, anarchy. What's worse is that it does this because here and now the proletariat is still noticeable by its absence as an autonomous force to wage class war and giving us real inspiration. And if at any moment our protests as a class time get out of hand and threaten their power which is the power of Capital-state, this government will not hesitate to repress us in a similar way as it did 92 years ago. For their part, the unions (without exception) are only merchants and negotiators for the exploitation of our labour power with the employers and the state. They always have been and always will be. Irrefutable proof of this is that this November 19 they are making a new effort to "reject" among other things, the "constitutional amendments" and government reforms to the labour code, requiring instead a code supposedly "for and favourable to workers” in other words a more flexible softer legal whip of capitalist exploitation, of wage slavery, which they neither name, criticise nor oppose. As always, they '’fight’' against the effects but not the cause or the root of all the evils we suffer as proletarians: capitalism. They only "struggle" for rights, reforms, crumbs from those who exploit and oppress us. Thus they corral, divert and ignore proletarian demands and protests. And also if these go beyond their limits, the unions (and leftist parties and front organisations) will do everything possible to quell the autonomous proletarian struggle. They are firefighters, reformers, opportunists, counterrevolutionary ... The unions are also enemies of the proletariat, therefore we must break with them and treat them as such. Proletarians: the experience of both past and present shows that, to meet our needs and class interests, we must fight to the end, outside and against governments, political parties and trade unions, in an independent or autonomous way, beyond and against all borders and nationality. At present, our class comrades fighting in Mexico, Chile, Brazil, the Middle East, Greece ... do what they can so as to give life to the world-historical thread of the proletarian struggle against capitalism. Our historical memory, our revolutionary programme, our class solidarity, our autonomous organisation, our direct action have been, are and will be our best weapons. NOVEMBER 15: NEVER FORGET OR FORGIVE, NEITHER SOCIAL PEACE NOR HISTORICAL AMNESIA! CLASS WAR THAT GIVES US SOMETHING TO REMEMBER! NEITHER LAW NOR "RIGHTS" NOR REFORMS! OUTSIDE AND AGAINST UNIONS, ELECTORAL FRONTS AND PARTIES! FOR PROLETARIAN RUPTURE AND REVOLT HERE AND EVERYWHERE! FOR WORLD COMMUNIST AND ANARCHIST REVOLUTION!